Last Saturday’s weather could not have been more perfect for a day at the beach. Yes, I’m perfectly aware that the nearest coastal beach is 683 miles from my driveway. I’m talking about the salt-drenched beaches of the Great Salt Lake. My recent visits to the Saltair area have been plagued by unbearable heat, and though the parking lot always seems to have a few cars parked in it, it’s been years since I’ve seen another soul on the beach. So I was pleasantly surprised when I rode my bike to the top of a recently deposited dirt hill behind the pavilion and saw dozens of people frolicking on the distant shore. Children waded in the shallows and teenagers lounged on inner tubes. Tourists snapped pictures of each other against the backdrop of the turquoise surf. The scene reminded me of an old picture- an iconic image very familiar to older Utahns and anybody who’s ever eaten at the downtown Chuck-a-Rama. Framed by a sprawling Moorish pavilion in the background, the photo offers a nostalgic glimpse back to the days when the lake’s southern shores were vibrant with crowds, when families splashed together in the murky brine and men wore suits and top hats to beach resorts. The idea of an ocean-like environment in a landlocked desert was a paradox irresistible to early Mormon settlers. They traveled westward on “pleasure excursions” as often as was practical to enjoy the allegedly therapeutic effects of salt water and the lake’s more sandy beaches. Black Rock was the destination for a two-day July 4 celebration in 1851, a 4-hour trek made by nearly every Salt Lake City resident. 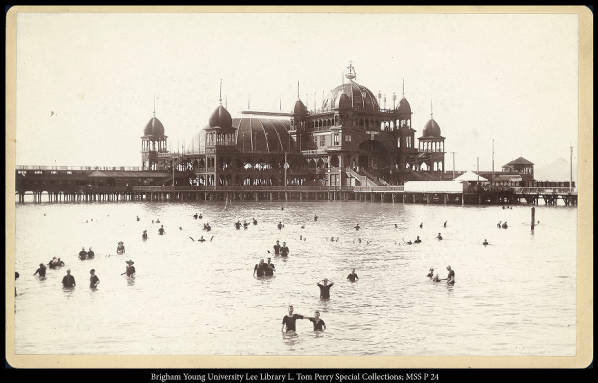 Concerned with the questionable standards of the various resorts that had sprung up around the lake, Mormon leaders spearheaded construction of a world-class resort meant to provide a recreational oasis for church members and compete the increasingly popular amusement park industry. Saltair was destroyed by fire in 1925 but was rebuilt a year later. The larger, more colorful incarnation was the Saltair of my grandparents’ memories. Saltair II continued in the grand tradition of its predecessor until the cost of upkeep in the harsh lake environment left it run-down and abandoned in the late 50’s. Fire again took the “Lady of the Lake” in 1970. Saltair III was constructed two miles west of the original at I-80 exit 104 and opened in July of 1982 to great fanfare. The new pavilion was created by converting a surplus hangar from Hill Air Force Base, and was designed as a small-scale homage to the majestic original. I remember paddleboats and waterslides, old train cars and gift shops; the overpowering taste of salt water while swimming with my aunt on the beach when I was very young. The high waters at Saltair III may have been what sparked my love for the ocean. The floods of 1984 put an end to Saltair III’s brief heyday. Violent waves crashed against its walls, and the structure sat partially submerged for nearly a decade. 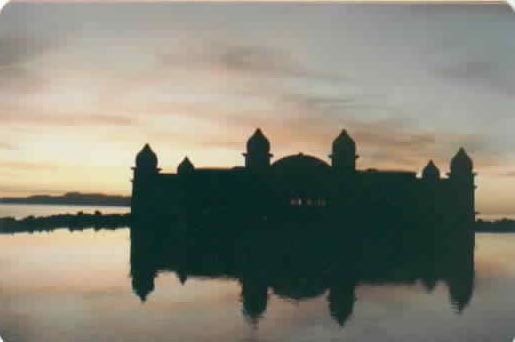 Saltair reopened on a limited basis in 1993 for concerts and special events. The venue now bills itself as “The Great Saltair” and the new owners have big plans. The dirt mound will be the seating area for an amphitheater, and barbecue pits will be installed later this summer. Saltair’s new lease on life was evident as I raced down the mound and toward the shore about 1/3 mile ahead. The flat distance between the pier and the shore was stable enough for riding, and I got strange looks from people making the journey. Foreign tourists in particular seem to be discovering what many Utahns seem to have forgotten. “The view is beautiful,” remarked an older man with a heavy Nigerian accent. Clad in a full pinstripe suit, he stood at water’s edge admiring Antelope Island in the distance. Jeremiah was with his son, Benson, who is here on a student visa. Both will be returning to Africa soon and wanted to see the famous lake. After taking their picture for them, I rode along the shore past more swimmers, including two women who spoke what sounded like Ukrainian. I paused before heading back to the parking lot to watch gentle waves lap at the alkaline shore. I wasn’t dressed for a swim, but but I longed to jump into the surf with abandon like the pioneer beachcombers of old. Saltair is located at I-80 exit 104. Access is free and the pavilion is open daily during summer months from 9AM – 6PM. Saltair hosts regular concerts and a unique gift shop, and is adorned with large photographs from the Saltair’s of yore. The dirt mound I mentioned was being overlayed with sod as this article went to press. Look for enhancements to the property this summer. For more information, visit http://www.thesaltair.com. That looks like quite a place. I bet it was a lot of fun in its prime. My dad had concession stands out there during the flooded years, people would always come up and say, “what’s that building”? And I spent a good deal of my childhood growing up at the lake. Many great and magical memories from this place. Even when the place was flooded there was a certain enchanting quality and “spirit” about it. When I see what the building has become, it makes me really sad. There is no more soul left in that place, it looks sick. It’s a real tragedy. I wish someone would take it over and really build it up. There is so much potential….anyway. After the original Saltair burned in April of 1925, Saltair II was built on exactly the same spot. But it wasn’t completed and did not open until 1931. So the photo of the flapper-looking women in swimsuits was taken that year or later, not in the 1920s. The building behind them is Saltair II, not Saltair I.